You can take the girl out of the trailer park, but you can’t necessarily take the trailer park out of the girl. 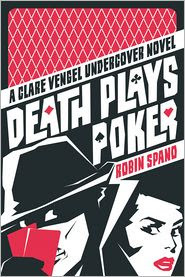 That’s the subtext of Robin Spano’s second Clare Vengel novel, Death Plays Poker (ECW). In her second outing, undercover cop Clare has been loaned to the RCMP to solve a string of murders taking place within the tightly closed world of professional poker. Clare goes undercover as a trust-fund baby trying to show daddy she can make her own way ... by playing cards. The biggest problem might just be that Clare isn’t exactly sure what a poor little rich girl might act like, eat, drink or wear. Although Clare’s fish-out-of-water concerns allow for some convenient expository moments, it becomes a little difficult to believe that this 23-year-old protagonist would worry that she is so very different from Tiffany James, the 23-year-old rich girl she’s supposed to be. In my experience, 23-year-olds have very different concerns utmost on their minds. This matter of the depth of Clare’s concern that people believe her as Tiffany is, however, a quibble. Spano does a convincing job of dropping readers into the dog-eat-dog-eat-cat world of professional poker, where a killer has been knocking off players one by one in their hotel rooms during tournament play. Among the victims is an undercover policeman whose death encourages fellow cops to bring in someone under an even deeper cover: enter Clare as Tiffany. The matter of unraveling the killings is complicated still further by a cheating ring that may or may not be connected to the deaths. Meanwhile, “the Poker Choker” continues upping his headcount and the pressure on Clare to deliver the killer is intense. Spano brings together an interesting set of characters in what becomes, in some ways, a closed-room mystery. Might the culprit be George, the poker blogger whose play is never quite up to snuff? Or Fiona, the gorgeous broadcaster who has made a career out of following the tour? Is it Joe, the pretty boy whose combination of good looks and good luck make him seem an unlikely suspect? Or maybe has-been Mickey, whose luck seems due to run out? While the tour moves from Niagara Falls to Vancouver, Clare’s concerns are pulled between solving her case and staying on it, while various of her handlers seem convinced that she isn’t up to the job and perhaps lacks the right stuff to match the fluke of solving her first case, last year’s very engaging Dead Politician Society.